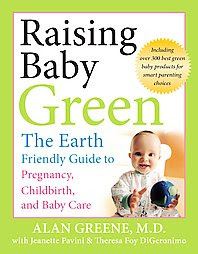 I recently discovered the book Raising Baby Green : The Earth-Friendly Guide to Pregnancy, Childbirth, and Baby Care and had to pick it up and see what else about our home I could reasonably expect to make changes to. Previously I reviewed Squeaky Green and mentioned how I appreciated that the authors of that book offered suggestions to the reader about how they could make their home more green. The authors laid out the information in their book in such a way as to encourage you, the reader, to do as much or as little as you like when it comes to "living green." I felt like the author of Raising Baby Green did the exact same thing - he leaves you with options. Greene hits on topics that concern parents from the time when the baby is still in the womb, through toddlerhood. What I ultimately concluded from his book was that the best way to take care of baby and make sure that baby is green, is to take care of yourself! By paying attention to the food that we (as adults) eat, checking to make sure our water is clean, that our house is cleaned with earth/people friendly cleaners, etc., helps to raise healthier children. It starts with the adults -- and then the children reap the benefits of hard research and implementation of "new" lifestyles. I like this book and found it valuable and practical since it offered suggestions and a variety of choices for me to consider for my family. 1. An inordinate amount of diaper rashes that we were beginning to experience. 2. The cost of buying disposable diapers. We figured out that we spent, on average, $70 a month on diapers. Over a 2 1/2 year time period that works out to $1260. (And since he steadfastly refuses to use the toilet, we're still buying diapers!) We're in the process of completing an adoption which means we're about to have another little bottom join our family who will be in need of diapers. If our two children were both in diapers until the age of 3, that's an estimated cost of $5,040. IN DIAPERS! OR I could front some of the cost and pay for a couple dozen FuzziBunz, spending around $430.80 more or less. (If you buy in bulk, you get a discount on FuzziBunz.) The adjustable diapers would fit both children, and any additional children we would have, which averages out to . . . a significant savings!!! 3. I'm not filling landfills. The FuzziBunz snap system is exactly that - a snap - and they are extraordinarily easy to clean. You can dispose of certain eliminations in the toilet, and then you just pop the whole diaper into the washing machine. I'm convinced. It's hardly any trouble at all to keep it up and I'm only sorry that I didn't start sooner. After the initial two diapers, I went out and purchased an additional a dozen FuzziBunz diapers and have plans to buy a few more once kidlet number two makes his appearance. I enjoy reading and learning more about how to be a good homemaker and whether or not I'm "green" while doing my homemaking is not really my ultimate concern here. Reading to learn, and reading to know how to better care for my family is the concern. I do find the "green" alternative the healthier and better but, as Dr. Greene points out, budget and lifestyle are significant issues. In this particular case, I do think that my reading as led me to the better solution for our family. I highly recommend Raising Baby Green and would encourage any mothers who are frightened of the cloth diaper idea to check out FuzziBunz. (Turns out they aren't scary at all!) Whether or not you are doing it for the environment or for health or financial reasons is not really my concern. I just think they are cool, convenient, and healthy and it's an easy and happy way for me to serve my little ones as they are developing and growing up! If you have any further book recommendations to this end, I'd love to hear them! 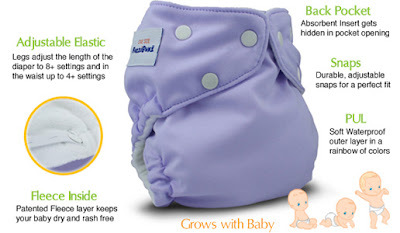 A very green friend of mine likes naturalbabies.com for all kinds of great resources, including several brands of cloth diapers. I think you can even register there for baby showers. As you know, I have no children, but I love the idea of using green products and supporting companies that distribute them. cloth diapers huh? Go beautiful you! I second the opinion of gDiapers for travel. Fascinating! I wanted to do cloth diapers with my son, but some health problems in our family which occurred right after his birth made life doubly difficult...so I opted for paper diapers for what I assumed was simplicity. I am very excited about looking into cloth diapers...Fuzzibunz sounds pretty impressive. I like to do Organic things for the health of my baby and family so I shall have to look into this book too! Thanks so much for Posting! I loved it!!! P.S. Did you really see a marked change in the diaper rash section? Hey Marks of Faith - The reason that the creator invented FB in the first place was because her son seemed to have an incurable diaper rash with every solution she tried. When she first made them and he went to them full time he never had a rash again and it was recovered very quickly. re: diaper rashes (I did e-mail Marks of Faith on the side) but I'll answer to everyone as well -- diaper rashes have been non-existant since switching over -- except for the day I didn't get caught up with the wash and reverted back to disposables for hte day! i have been avidly following this whole "cloth diapers are the in thing to do and environmentally cool" debate, looking forward to Princess Johnson in Sept. There is SO MUCH information and stuff to read!! It's overwhelming! but, remember that until just merely ONE generation ago, mommies used cloth diapers. They are do-able. :) But i did use and do recommend disposables when traveling! much love to you all as you strive to care for your children in a loving and green (and rash-free) way!